No matter how you personally feel about Amazon, it undeniably has power in the publishing industry. Amazon is the number one bookseller in the world. For that reason, authors need to make sure they are using Amazon to its full potential. Below we have assembled some tips, mostly drawn from our Buzz podcast episode, about the do’s and don’ts of selling your book on Amazon. Complete your Amazon author page. Your Amazon author page is a separate page from the book’s page. This is a good way for readers to learn more about you, and it also keeps all of your books available on Amazon in one central location. Give the same amount of attention to your author page as you did to your book page. Consider a KDP ebook. It can be incredibly beneficial to publish an ebook through KDP (Kindle Direct Publishing). This will give you the opportunity to run ads through the program, allowing you to directly reach your readers. For more information on how (and why) to use KDP, explore the resources offered on evergreenauthors.com. Wise Ink’s Marketing Director took the Amazon Masterclass for Authors and learned important tools and tricks to optimize an author’s Amazon presence. Actively seek out reviews. Because of Amazon’s algorithms, reader reviews are incredibly important to making your book easier to find. Most readers click through both positive and negative reviews before purchasing a book, so reviews are also important in convincing people to purchase. Don’t be afraid to ask for reviews or interact with people who have left reviews on your Amazon page. Do what you can to make sure your book has reviews. Don’t approach Amazon from a place of resignation. For some people, Amazon can be intimidating. It’s difficult to fully understand the website’s algorithms, and you want your book to stand out from the rest of the books on the market. Don’t approach your time on Amazon as a chore that needs to be completed; remember that this is another platform for you to spread the exciting news about the incredible book you published. Don’t let Amazon be the only part of your marketing plan. It’s dangerous to rely on any one marketing strategy, and Amazon is no exception. Although Amazon is very important, it can’t be your only marketing strategy. Make time for other (potentially more personally engaging) marketing strategies. Don’t rely on any marketing strategies that don’t feel right to you. Authors are sometimes told to ask every friend you have to buy your book at the same time and leave 5-star reviews, or even told to pay a company to work behind the scenes to make your book rise on Amazon’s rankings. While these things might have value, especially if it’s important to you to become an Amazon Bestseller, think about both the ROI and your own personal sense of ethics before you take that route. These could be good strategies, but check in with yourself before you do anything that might potentially make you uncomfortable or might not pay off financially in the long-term. With that, we hope that you are feeling more confident in your ability to maximize your Amazon presence. For more information about marketing your book, check out Wise Ink’s podcast, Buzz: Book Marketing Made Easy. We know that authors are busy people, so we’ve taken the time to compile seven podcasts that can help you learn important skills of the trade and entertain you as they educate. These podcasts will help you master grammar, market your books, and give you some good stories to listen to for inspiration. 1. Helping Writers Become Authors by K.M. Weiland: K.M Weiland is an author herself, so her input on the writing process feels genuine and useful. She begins every podcast with an update on her writing, which helps you feel like you’re not alone if you struggle with writer’s block or think that outlining your book is difficult. She then launches into a brief tip about specific writing strategies. Her episodes are usually under 20 minutes long and are full of helpful examples and strategies to help make your writing better. 2. The Entrepreneurship Elevated Podcast by Mike Michalowicz: This energetic podcast helps entrepreneurs gain the skills they need to run a profitable business. The podcast is recorded with a few friends, and sometimes a guest speaker, and is primarily an enthusiastic conversation. However, woven into these conversations are good tips about how to market yourself, build community, and make a brand. 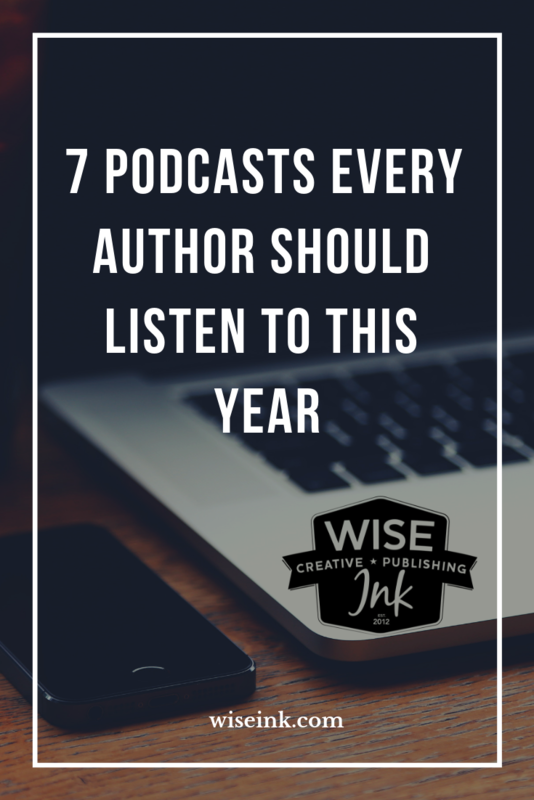 Authors need to be the number one promoters of their work, so this podcast can help you focus on the business side of your work as an author. These episodes are usually about 50 minutes long. 3. The Marketing Book Podcast by Douglas Burdett: Every week, Burdett interviews an author of a book about marketing. The episodes include useful links and other resources that let you take your learning beyond the podcast. Every week’s author has valuable marketing information that they’re happy to share, and if you enjoy the episode, you know that the guest speaker wrote a whole book about the topic! Marketing your book is an important part of being an author, so these are valuable skills to learn. 4. Grammar Girl Quick and Dirty Tips: If you’ve ever used Grammar Girl’s website, you know how helpful she can be when it comes to those little grammar or spelling tips that you’ve never quite mastered. These brief episodes (around 20 minutes each) give you two grammar lessons apiece, but she has a way of slipping in details so you learn way more than you expected. This podcast is a great way to refresh your grammar knowledge or search out an answer to a question you have. 5. Writing Excuses by Brandon Sanderson, Mary Robinette Kowal, Howard Tayler, and Daniel Wells: Brought to you by four iconic fantasy and science fiction authors, this podcast focuses on writing techniques that have a fantasy element but can be easily extended to other types of writing (such as world building and writing characters who are different from yourself). These podcasts are designed to be brief and informative and are usually under 20 minutes long. Between all of these big-name authors, there’s a lot of experience to be shared and learned from. 6. Copyblogger FM by Sonia Simone: This podcast is focused on content marketing and will give you tips on copywriting, building a social media platform, and understanding how to maximize your website. These episodes are usually around 25 minutes long, and each episode gives you tips on specific techniques. Maximizing your online presence is very important for authors, but it’s a difficult skill to master, and this podcast will help you feel more comfortable about it. 7. The Stoop Storytelling Series by Laura Wexler and Jessica Henkin: Every Sunday, Laura and Jessica post a new story from a guest speaker. The two introduce the episode, and then play a recording of the guest telling a story that relates to whatever the predetermined topic is (ranging from love, to immigration, to dogs, to holidays, and anything else you can think of). This is a great way to think of new ways to tell a story and to recognize the value that your lived experiences have in becoming an interesting story. The episodes range in length from 15 to 35 minutes, depending on how many stories they feature. And as a little something extra, we’ve included an eighth bonus podcast: our own! WiseInk recently launched our own podcast, called Buzz: Book Marketing Made Easy. Based on their incredible book Buzz: The Ultimate Guide to Book Marketing, this podcast is brought to you by Dara Beevas and Roseanne Cheng. This podcast gives tips to authors about how to best market your book! How to ENJOY Marketing Your Book! Check out these beautiful sketch notes courtesy of Drawnwell! Four Great Books for Spring! The holidays just passed, and it can feel like you’ve used all of your creative gift ideas. We’re here to help you shake up your gift-giving with four books that will make a perfect gift for that special person in your life. Getting Unstuck: A Guide to Moving Your Career Forward, by Meredith Crosby is the perfect book for the hardworking women in your life. Written by a woman who has worked her way up many corporate ladders (including working for McDonald’s, 3M, and Comcast), this book gives real, concrete advice on moving your career forward. Full of personal anecdotes and advice from her mentors, this book will help your loved one keep her career momentum going. Better Parenting: A Guide for Somali Parents in the Diaspora, by Ruqia Abdi is the perfect book for first-generation parents. Parenting is never easy, but parenting second-generation children adds an extra level of challenge. This book helps parents learn to balance American culture while still upholding the values of their family’s heritage. This insightful book blends research, a deep understanding of community, and personal experience to offer a useful guide for Somali parents. Sanda, The Girl with the Magic Smile, by Sabina Mugassa Bingman is the perfect gift for adventurous young children who are interested in exploring their own culture. The children’s book describes Sanda’s experience with the traditional art of teeth-carving on her island home. The energetic young girl learns to embrace her inner beauty and honor the importance of her cultural traditions. This book teaches powerful lessons on self-acceptance to young children. Healing: The Radical Act of Self-Care, by Dr. Joi Lewis is the perfect gift for the worn-out activist in your life. It can be exhausting to give so much of yourself to causes that can seem endlessly overwhelming, but this book will remind your activist loved one to take a step back and focus on healing themselves before they can heal the world. This book provides a method for reclaiming one’s humanity using both self-care and community care and would make a great gift for your loved one who needs to focus on healing. That dreaded moment has arrived - the hype surrounding your new book has faded a bit, and your sales are starting to slow down. What can you do to bring those number backs up? Get creative - there are a lot of ways to get your name out into the world, and once you find something that works for you, go for it. If people are hearing about you and your fantastic book, sales will follow. It can be disheartening to see stale sales, but with some hard work, the end result will be worth the time and energy you put into bringing the sales back up. And remember: you’re not just selling selling your book, you’re also selling yourself as an author. So if there’s an event opportunity that isn’t strictly related to your book, don’t write it off; it would be a good chance to network with others and let them know about your work. Don’t be afraid to take a chance! You lose nothing by talking to people - and if you’re lucky, you might make some friends who are willing to let you sell your book at their next event. It’s a tricky question; plenty of authors are skilled with pen and paper but hate the idea of speaking to a crowd. You don’t need to be a professional public speaker in order to reach your audience, but in order to effectively market your book, you should probably have some public speaking skills in your back pocket. At the very least, you’ll want to be comfortable enough with public speaking to do readings and similar events to promote your book. To help you out, we’ve put together some tips on how to feel more comfortable in the podium spotlight. Tip #1 - Talk about topics you enjoy talking about. If you’re trying to speak on an unfamiliar topic, you’ll most likely be stressed on the stage, and that stress will show. It’s much harder to engage with your audience if you lack passion for the subject matter. Before agreeing to speak at an event, ask yourself what you know the most about. What are you interested in (related to your book, of course)? Is there a subject area that you have spent time and energy learning about? What do you think your audience wants to hear? Tip #2 - Find a way to personally connect with your audience. One effective way to do this is to open with a personal anecdote that relates to your overall topic. Do you have any life lessons to share based on your past experiences or mistakes? What are some relevant life hacks that you have discovered and want to share with your audience? Tip #3 - Make sure you’re speaking to groups at locations that connect with your book topic or genre. Ultimately, it isn’t worth spending a lot of time and energy on a speaking engagement that won’t bring new readers to your book. Look for places that cater to your audience’s demographic and seek out speaking opportunities at those locations. Every author is different, and thus every author’s approach to using promoting their book via speaking engagements is going to be different. The amount of public speaking you want to do is up to you, but it’s somewhat inevitable when it comes to selling your book and promoting yourself. Practice makes perfect, though, and the more experience you have with speaking to an audience, the easier it will become. One challenge that some of our authors face is wanting to market their book to a wider audience but being unable to travel. This means being unable to attend events, speak about their book to people in person, and/or give talks at schools or other locations. While this can be a frustrating hindrance, being unable to travel doesn’t mean you don’t have other opportunities to reach out and share your work. Here are a few ways to do this. Plenty of authors connect with their audience in ways like these even if they are able to travel; no effort is wasted in reaching out to your readers. There are also plenty of other things you can do to market your book without traveling, but these ideas tend to be the most popular, and often the most successful. Being unable to travel isn’t the end of the world for your book - by adjusting your marketing approach and focusing your attention on what you can do, you’ll figure out the most successful use of your time. Joining a local literary community can seem like a daunting task if you aren’t familiar with the options in your area. Not only can it be difficult to find a group that fits your individual style - there’s also the issue of finding groups in the first place. To help you get started, we’ve made a list with a few different places that often host or advertise such groups. After finding a few groups that interest you, attend their meetings to learn more about the groups and see if they’ll be a good fit for you. It can be a little awkward at first, especially if the members of each group seem comfortable and familiar with one another. You might feel like you’re trespassing, or like you don’t belong. But just remember - they advertised the group for a reason. They want to bring in new people. The next step is figuring out which of these groups is the best match for you. You want to find a community that fits you and your writing. - Does the group fit your writing genre? - Do you already know any of the people in the group? - Have you attended more than one of their meetings? - Is there a group that is focused on a topic that you are passionate about? Don’t forget to consider the necessary time commitment. If you really like a group but don’t think you have time to be a full member, see if you can do an event with them or speak to them about your experience as an author. Most literary communities are always looking for new people to share their stories. If you truly can’t find a local group that meets your needs, consider starting your own. You never know; there might be a dozen other authors nearby who are waiting for a group like the one you could create. But don’t give up hope in the meantime. When you find the right literary community, you’ll know - and you’ll thrive with them.